If there is one thing that chocolate lovers agree on is that there is never enough chocolate. Well, how about melting down a batch and then dipping chocolate pieces into that? 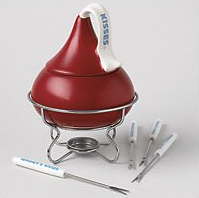 Because with the Hershey’s Kiss Dessert Fondue Maker I don’t see any other option. Sure, you could dip fresh strawberries into the iconic Hershey’s Kiss, but why would you do that when you could just dunk in a Hershey’s Kiss?